Q. We're ready to upgrade to the new Windows 10, but before we do, I just want to make sure that our TimePilot software is compatible. Is it? Q. I have TimePilot Vetro and accidentally set "No Overtime" as the default option. How do I change things to reflect our OT policy? The system won't let me delete "No overtime" or set the new overtime policy as the default. Start TimePilot Central and click Setup > Overtime Setup > Add an Overtime Policy. Create your policy and save it. When you are done, you'll see it in the list of policies, along with the "No Overtime" policies. Now you'll assign that policy to your employees' Pay Type. Click Setup > Pay Type Setup. Highlight the Pay Type that should contain your newly created Overtime Policy and click "Edit a Pay Type." The second question is "Do Employees of this Pay Type Qualify for overtime pay?" When you click the "Yes" radio button, you'll be asked to choose an Overtime Policy. Choose the newly created policy from the list. Click "Save" and close the Pay Type box. When you do this, every employee who has that Pay Type (presumably your whole workforce) will be assigned the newly created overtime policy. Did you feel the leap? On June 30, scientists added a "Leap Second" to worldwide time to get the time calculated by atomic clocks to match with the exact time of one rotation of the earth. Ocean tides are causing a tiny braking action on the earth's rotation, causing days to get slightly longer. Since 1972, 26 leap seconds have been inserted. In the past, Leap Seconds have caused problems with server networks, financial markets, web sites and GPS systems, but this time there were only a few minor disruptions across the world. 91% of Americans change their sheets every two weeks. 35% of Americans don’t use bedroom curtains or shades. 78% of Americans have at least one caffeinated beverage a day. TimePilot Q&A: Windows 10; OT policies; more than one PC. TimePilot Lead Story: All About Rounding. Cool Stuff: Microsoft Office cheat sheets. The Deal: 20% off Extreme Blue, Vetro or Tap clocks. 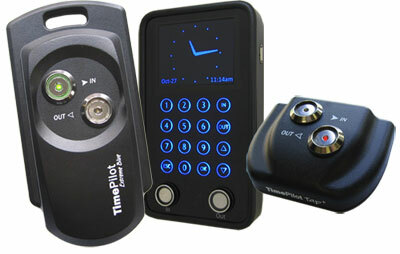 Expand your TimePilot system with extra clocks. Extreme Blue comes with a padlock and mounting plate; Vetro comes with a power supply and USB drive, and Tap comes with a USB cable. or call us at 1-630-879-6400.